Here's something most of us probably weren't aware of. Since Unicode 6.0, Emoji flags have each been given a two-letter regional indicator listed in ISO_3166-1. Until now, only ten of these flags actually showed up as images on Android. This remains the case on other platforms, such as iOS, Windows, and Mac OS X. Instead of an image, you see the two characters associated with each country. You can test this out for yourself by going over to Emojipedia and seeing which flags load (the ten standard ones are placed separately at the top). On Android 5.0, this situation changes drastically. 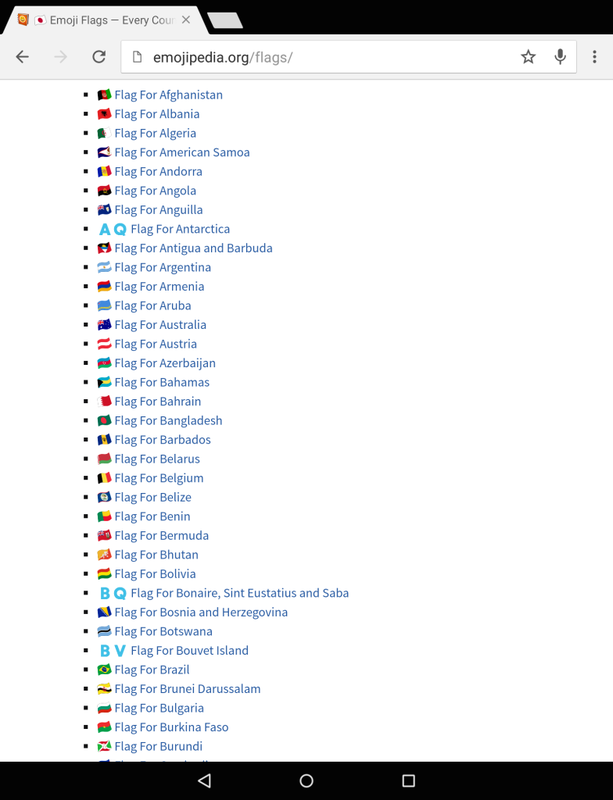 Users are able to see over 200 flags. Here's what the page above looks like on a Nexus 9. For comparison, here's a portion of what I see using Chrome OS. These flags don't show up on the Android 5.0 keyboard, and with so many of them, that's probably a good thing. But if you do make the effort to insert them otherwise, you're in for a much more visual spectacle.